Getting started in music recording and production can be very tedious, especially if you are running on tight budget. That is why having good, affordable options matters a lot. Today we are going to show you some of the best condenser microphones you can get under $100. As you are about to find out, these are easily among the best mics in general, depending on what kind of use you have in mind. Speaking of which, later on we will discuss some viable applications for this type of gear as well as what you can expect from a $100 mic. Chassis that was built to work under real, adverse conditions. Great sound quality especially when used to record loud instruments. Has enough finesse to capture the color of acoustic instruments. You will probably need two of these for best results. When it comes to big brand names, you won’t find much better or bigger than AKG. Their mics are legendary to say the least and an important piece of numerous world class recording studios. What makes this brand great good is the fact that they offer some of that quality and spirit in their budget solutions. AKG Perception 170 is one. 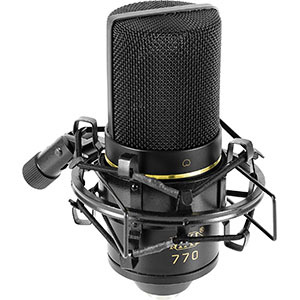 Being a pencil mic, you would expect Perception 170 to be very limited in many ways, but that is not the case. AKG has done their magic once more and delivered a microphone which has enough punch, finesse and power to serve in a variety of applications. It doesn’t get much bet better than this at this particular price point. A functional and classic design that has good aftermarket support. Good choice of hardware aimed for a solid overall performance. One of the best entry level designs on the market. Comes with no accessories, no mounts or cables. Audio Technica is one of those brands that have struck the golden balance between price and performance of their products. They seem to have the perfect entry level race horse for just about any category. Audio Technica AT2020 is that race horse when it comes to their condenser microphones. There’s not other way to describe this mic other than awesome. You are getting a perfect combo of functionality, great design, proper hardware and good performance. While it may not be something many professionals would use for high end projects, AT2020 has found itself in numerous enthusiast grade and even semi pro recording studios all around the world. If you are looking for an all around good performer, look no further. Compact design makes it suitable for use on the go. Great build quality that is standard for Yeti condenser mics. Great quality of sound and a pretty decent polar pattern. Lacks the finesse for more serious recording of acoustic instruments . If you’re not sure whether or not condensers are something you want to get into, there are solutions such as Blue Snowball iCE which may be a suitable compromise. This is a condenser microphone but it doesn’t require phantom power to work. Instead of requiring an XLR cable, you can just plug it into your computer using a USB cable. When it comes to performance, this little ball of style packs quite a nice punch. You’re looking at a good recording pattern followed by a well tailored sensitivity profile. Is it a perfect solution for proper studio use? Probably not, but this mic is an awesome choice for those who want to start a podcast or record voice in general. A simple but functional design that just works. Reliable build quality that ties into the consistent performance. A set of features which are fairly rare. An aesthetic which is quite elegant. May be a handful for new users. With so many different brands competing in a limited market, everyone is trying to deliver something unique or new. Not MXL, though. They are doing quite the opposite and it is the reason why they are gaining in popularity. This brand packs models such as MXL 770, which are about as regular as they often get. However, this mic works. Sometimes reliable performance is much better than flashy new features. Speaking of which, MXL 770 is nothing to joke about. This microphone comes with a high pass filter as well as a -10dB pad. These features are still rare in this particular price range. With that said the overall build quality is quite surprising even for MXL, and inspires confidence. Good build quality that has been synonymous with Razer lately. A simple yet functional design and comfortable dimensions. Actually competitive performance when it comes to recording quality audio. The whole gaming aspect of the mic is somewhat forced. 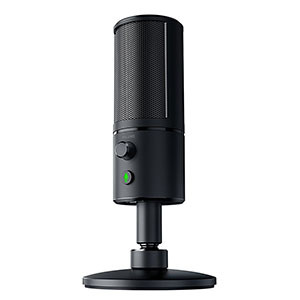 Razer is probably the last brand one would think of when looking or condenser microphones. At least that was the case a couple of years ago. However, this gaming giant is slowly creeping into the world of high definition audio. Razer Seiren X is a very interesting condenser, cloaked under the guise of offering a better gaming experience to its users. In reality, this USB condenser packs some pretty interesting solutions. For starters we have a built in shock mount which works fairly well. Then there is the super cardioid polar pattern which means a bit more precision and a more directional input. As it turns out, all of these features come in handy when you’re recording acoustic instruments and vocals. Shure quality that's apparent from the moment you unpack MV5. Good quality of sound right off the bat. Great set of functional features aimed at helping out beginners. It is a bit unwieldy without a stand. Shure, being one of the authorities in the industry, is full of surprises even in the affordable segment of the market. Shure MV5 offers something quite refreshing which may be suitable for new users and those who just want to record music. As you can probably tell, it is a USB mic that features a vintage design and much more. As a digital condenser, it is offers above average definition and sound quality for this segment. However, it truly excels in features. Instead of bothering you with polar patterns, attenuation and other things, Shure has built in several distinct recording profiles. This way you can select a Vocals profile if you’re recording voice, or the Instrument profile for acoustic instruments. 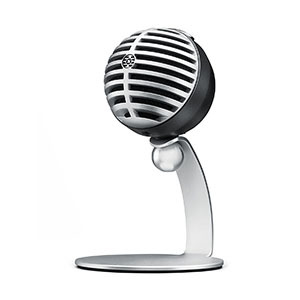 Great looking microphone suitable for traveling professionals. That standard Audio Technica reliability and build quality. Comes with a stand and cable necessary for use. Offers pretty refined performance for recording vocals. It is one of Audio Technica's more niche builds. To say that Audio Technica is one of the most involved brands in the budget segment would be an understatement of the century. 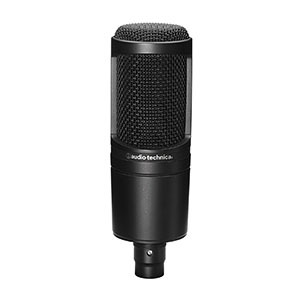 They offer some many awesome models, including general purpose ones and niche mics such as the Audio Technica ATR2500-USB. This model carries over a lot of the hardware from its more conventional cousins, which is pretty great. There is no doubt that this model is meant to be used for podcasts, audio interviews and voice recording in general. It is fairly compact but still large enough to accommodate a proper large diaphragm capsule. The thing that matters the most however is the digital resolution it offers. You’re looking at 16 bit, 44.1/48 kHz sampling rate. A simple, function oriented design that just works. Stylish design and a plethora of color themes guarantee that you'll find a good combination. One of the larger diaphragms in its class. Lack of any kind of features is somewhat disappointing. 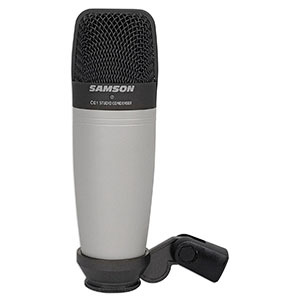 Samson is one of those brands who are all about a no nonsense performance at the cost Samson C01. There is absolutely nothing high speed about this microphone. It is about as generic as they come in terms of design. However, its function comes first over form. This thing packs a 19mm diaphragm, which gives it plenty of ability to pick up deeper nuances of your voice. The microphone works very well with most amps and isn’t too picky or fussy. The only downside is the absolute lack of attenuation or on board sound optimization. In all honesty, we’re ready to let that fly considering the price. A somewhat flashy vintage design that looks stylish. Great set of hardware which is really optimized for performance. Good availability of aftermarket accessories. Reliable sound that allows you to learn the ropes efficiently. It doesn't come with any accessories aside from the case. When it comes to raw bang for the buck value, there are only a handful of options out there. As it just so happens, MXL makes a good number of them. Models like the MXL V67G really make it easy to build a decent home recording studio. This mic has it pretty much all. From vintage flashy looks to performance. What makes the MXLV67G a very attractive package has nothing to do with feature because there aren’t any. What you are getting is a rock solid set of hardware which includes a massive 32mm condenser capsule, a very delicate diaphragm and a proper preamp to take care of it all. These few simple things are all you need in general. A simple, timeless design and a neutral color scheme that. Great build quality considering the price. A full array of aftermarket accessories but also stock ones. Good performance for the money. Might be too boring for some users out there. Good USB condensers are becoming pretty easy to find on a moments notice. Even so, there are still quite considerable differences between supposedly standardized models. Marantz Professional MPM-2000U is a good example of what we mean. It is a proper condenser with a large diaphragm that offers plenty of detail, a good A-D converter and plenty of accessories to boot. Truth be told it may not be as interesting looking as some other models on the market, but it’s a true performer. 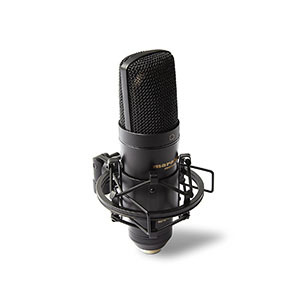 Also unlike most other USB mics in this price range, Marantz Professional MPM-2000U can actually be used in a studio setting. Granted the audio quality will suffer due to the digital converter, but you’ll still get good sound. Where do $100 Mics Fit Into? In the grand scheme of things, $100 microphones are still very much considered to be budget units. So much so that most pros would most likely tell you that this price range is where you should start your search anyway. Does that mean that $50 condenser microphones are bad? Not at all. As it turns out, every category of condensers has its place. It just depends on what kind of recording you are looking to do. With all that said, we have to agree with most professionals on this one. 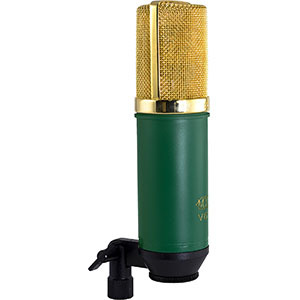 If you are able to invest a $100 or more in a condenser microphone, you can really get some sweet deals. The models we have listed above are just the tip of the iceberg, although they are arguably among the best out there. It would be even better if you could spend a bit more and get a $200 condenser. We fully understand that not everyone can make such a commitment, but it is worth considering that a $200 mic is the sweet spot for proper home studio recording and music production. What Can You Expect From A $100 Condenser? Just like it is the case with any other piece of gear, everyone wants to know just how much they can squeeze out of their budget. With $100 condenser microphones that question has a fairly straight forward answer. 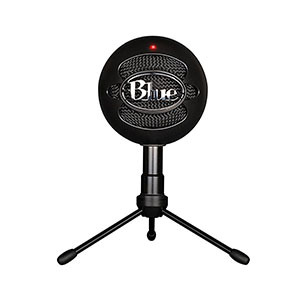 In this segment we are going to discuss what you can expect to get from a mic in this price range. This is also an area where you really need to remain realistic with your expectations. Anyways, lets get to it. One of the good things about $100 condensers is the fact that you are getting pretty solid hardware. This is the segment of the market where you first start seeing actual large diaphragms and proper capsules. In other words, if you were to go up a segment, chance are you would see this same hardware only tricked out with a few additional features. The thing is that those additional features don’t necessarily dictate the overall performance of a microphone. Because of that, there are some pretty good producers out there who are doing borderline miracle work with budget gear. Another thing worth noting about this price range is that you will run into some fairly good USB mics as seen on our list above. Even though there are those who don’t consider USB condenser to be ‘true condensers’ for some reason, no one can really argue the fact that these mics are just so practical. This is especially true if you are podcasting on the go and like to travel light. Speaking of features, you will see some interesting additions to the standard layout. However, keep in mind that this depends on the type of microphone you are looking at. For the most part, these features will come in form of attenuation pads. Some brands offer -10dB while others go as far as -20dB on their budget models. Having any kind of attenuation is already a large boost in both performance and functionality. Not only are you are now able to record louder acoustic instruments, but you don’t have to spend hours trying to find the perfect mic position to do so. If the volume is too much for your microphone’s sensitivity, all you have to do is push that attenuation button and you are good to go. With everything said, we would like to point out that pencil or small diaphragm condenser microphones in this price range are pretty much close to the industry standard. 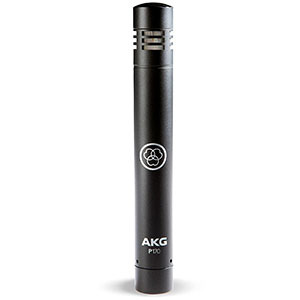 For example, you will see the AKG model we have listed above being used in a variety of professional environments. The fact that you will most likely need more than one to properly mic up a drum set for example, means that these can get pretty expensive pretty quick. However, what matters is that you can get away with using one. Now, pencil condensers are great for getting those acoustic instruments dialed in. What they aren’t so great for is vocals. This means that you can save yourself a lot of trouble and get one of these if you know that you won’t be recording any vocals. On a similar note, we strongly suggest that you stick with a standard large diaphragm design if recording voice is in your repertoire. All in all, doing proper music recording and production will lead you to develop a rather large collection of microphones. This is also kind of the point of the whole thing – no one microphone is going to be good enough. Much like a hammer won’t be helpful when changing a tire, having the right tool for the job is what it all comes down to in the end. The $100 segment of the market is a very exciting one for a number of reasons. You will find some pretty awesome condensers in there which will prove to be quite efficient as entry level gear. If we had to choose one mic to represent the entire category, it would have to be the Audio Technica AT2020. It’s just an all around best performer that can serve a wide spectrum of applications with equal quality. With that said, we would like to point out that Yeti’s Snowball also packs quite an impressive sound considering its rather compact and mobile nature. The appropriate research can do wonders if done properly. We are here to help you and save your time and money at the same time. In our website you will see our personal recommendations based on our knowledge and extensive research. What we base our rating using the product details and customer feedback. AudioRumble.com is a partipant in the Amazon Service LLC Associates Program, an affiliate advetising program designed to provide a meane for sites to earn by advettising and linking to Amazon.com.